Hello and welcome back! Thanks for still being here after my Scares That Care break last week (sidenote: HOLY CRAP is that an amazing convention). I’m back for my summer blog series which attempts to explain my horror heritage as a West Virginian; why I am the horror fan you know and love today. Today, once again, we draw our inspiration from The Telltale Lilac Bush. In this book there are chapters dedicated to some of the hazardous jobs of old-timey West Virginia namely, coal mines and railroads. 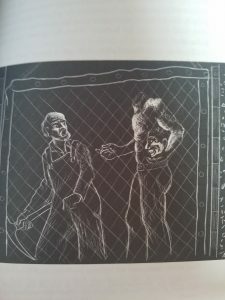 The two chapters, titled Mine Ghosts and Railroad Ghosts contain fourteen stories between them and have some of the most gruesome deaths detailed within. 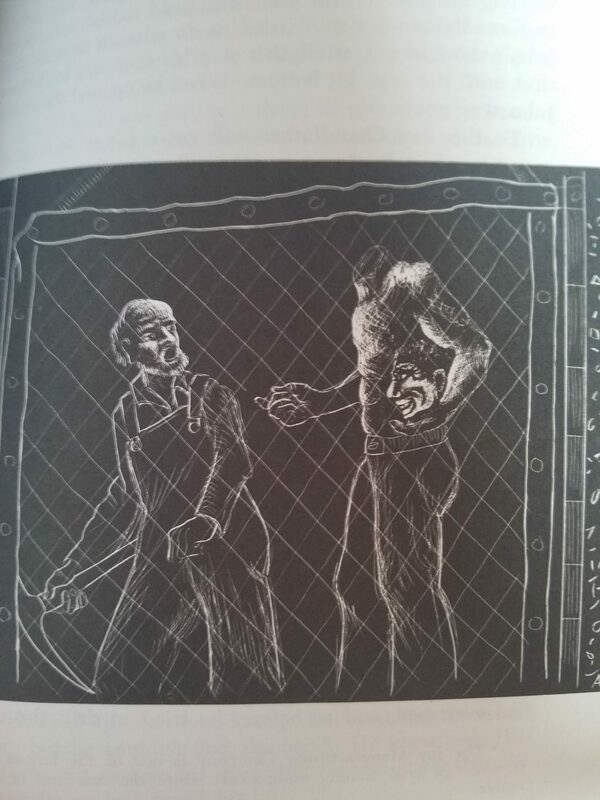 The above is a picture from our tome of folk-horror, next to a story called Big John’s Ghost. Musick notes at the beginning of the mine ghost chapter that of all of the stories that she collected for that section, none of the stories detailed a malevolent spirit or one seeking retribution. These ghosts usually want to pop in and say “hello” or in one case, a ghost is seeking to make sure that his widow is properly compensated after his death. But the mine deaths are horrible. Even today, there are still mine accidents that happen, causing injury and death. The coal miner is iconic for West Virginia, but so are the dangers that go with the job. These old tales tell of cave-ins and mine explosions. How awful! I’m going to assume that, like me, you know next to nothing about mining, especially the type of mining that was done in the late 1800s and early 1900s. The bane of the miner, I’m told, was the sulfur ball. They are extremely hard and almost impossible to drill through so dynamite was often used to get through them to the coal vein. There were many accidents because of those stubborn, hard balls. Explosive accidents (Big John in the picture up there had his head blown off by a stick of dynamite) and slate falls, unfortunately, were not uncommon. The horrible nature of these accidents didn’t always make for the most welcoming looking ghosts, according to our reference book. Railroad ghosts are not so different from mine ghosts in that they aren’t told to be of a nasty breed of restless dead. I believe that I’ve made mention before that the railroads were very slow getting to the Appalachian region, but when they did, it was a sloppy rush job. Safety measures that are common today were not used then, and you must remember, because of the mountainous quality of the region, many tunnels had to be dug since trains weren’t exactly great climbers. I’ve walked through many of these old rail tunnels and there have been two that gave me a real case of the heebie jeebies. They’re all dark, cold, and damp but these two just had something extra to them that had me jogging to get to the other end already. They’re mostly out of use now, many of the railroads have been turned into walking trails which is scenic and wonderful in my native area of West Virginia. But it’s almost as if those lines and tunnels have bad memories that they share with you when you walk them. So many died and, unlike mines, they’re accessible by just about anybody now. You’re very aware that you’re walking over the sites of ghastly, gory accidents. As always, I greatly encourage you to grab a copy of the Telltale Lilac Bush if you’re interested in haunted lore and if you ever happen to be in North-Central West Virginia, take a hike of the Rail Trail between Marshville and Salem. You’ll find one of those damn spooky tunnels. Next week: Omens! Creepy Prophecies from the Supernatural! Or something like that. Thanks for reading!